View of a single archway bridge to transport coal from Tanfield Coal works to the River Tyne. 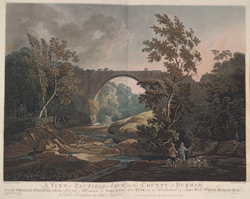 'Local Records' of 1833 by John Sykes explains "Tanfield arch, in the county of Durham, a remarkable structure, was built by Colonel Liddell and the Hon. Charles Montague, the founders of the partnership now vulgarly called The Grand Allies, to obtain a level for the passage of coal wagons. It is frequently called Cawsey Bridge, from its being built over the deep and romantic dell of Cawsey Burn, near Tanfield. The span of the arch is 103 feet ; it springs from abutments about nine feet high, and being semicircular, the entire elevation is about 60 feet ; it cost £1,200. The architect was Ralph Wood, a common mason, who having built a former arch of wood, that fell for want of weight, committed suicide from a dread of this beautiful structure experiencing a similar fate…. This arch was built for a wagon-way to a colliery, which was set on fire, and has been long unwrought. It has been many years neglected, and is falling to ruins".